Wash the pieces of fish & drain completely. 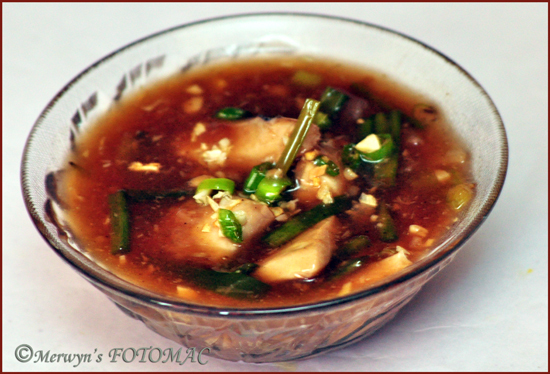 Marinate the fish with ginger-garlic paste, light soya sauce, 1 tbsp. corn flour & a little salt for about 30 mins. Heat oil in a wok till hot. Reduce heat & slide in the pieces of marinated fish. Fry few pieces at a time on med. till cooked & transfer to a plate. In the same wok, saute on high chopped garlic, ginger, green chillies till rawness disappears. To this add sufficient water & fish stock. Stir well & let it come to a boil. Then add dark soya sauce, rice vinegar, oyster sauce, sugar & stir to combine well. Mix corn flour with a few tbsps. of water to prepare a thin liquid. Add this to the gravy & mix well. The gravy should be smooth & without lumps. Gently slide in the pan fried pieces of fish & stir carefully taking care that the fish does not break. Adjust thickness of gravy. It should be of pouring consistency after the fish has absorbed some of the liquid. Lightly pan fry flaked onion/shallots & diced capsicum & add to the gravy & combine well. Make sure this has some crunch. Add some chopped spring onion greens & stir for a minute. Transfer to a serving bowl. Garnish with some more spring onion greens. You may garnish with some more lightly fried finely chopped ginger-garlic if desired. Serve piping hot with Prawn Fried Rice or any other fried rice of your choice or with noodles or steamed rice. Variation : You may deep fry the fish coated with batter if you so desire before adding to the gravy. Note : Use salt sparingly as sauces contain salt.